If you’re looking for simple ways to maximize your business efficiency, then free remote desktop software may be the answer you’re looking for. However, finding the right one for your business can be a bit tricky, to say the least. Investing in a free remote desktop software doesn’t have to be costly. In fact, you don’t have to draw out thousands of dollars to get one that is both cost-effective and a real value to your business. In today’s article, we’ll provide you with a list of features you need to look for in a free remote desktop software. Remote desktop is a separate program offered in most operating systems that allows a user to connect to a computer from an offsite location. This technology enables the user to use and interact with the remote computer without the need for his or physical presence. Most people use remote desktop to do a variety of things. One example would be remote working. Imagine receiving an unexpected business task from a key client while on day-off. With remote desktop, you can still work on that task handed to you even outside of office hours. This keeps business functions running and maintains business opportunities. Provides Work Flexibility - As stated earlier, remote desktop allows you to work from anywhere at any time. It doesn’t matter if you’re working from home or at an exotic holiday spot. As long as you have the resources needed, you can still meet business emergencies even in the most unforeseen circumstances. Reduces Cost - Since remote desktop allows a work from home culture, you don’t have to spend that much on office necessities such as coffee, toilet tissues, and the like. Also, you don’t need to worry about paying thousands of dollars to maintain the condition of your office equipment since your employees don’t use them on a regular basis. Improves Employee Turnover Rate - Working remotely allows your employees to have more time to spend with their families and loved ones. This enables to maintain a healthy balance between their work and personal lives. In return, it boosts their work satisfaction rate and decreases their attrition rate. What are the Things You Need to Consider in a Free Remote Desktop Software? If you’re still struggling to find the best free remote desktop software for your business, then check out the list of remote desktop features you need to consider first before acquiring one. The main thing you need to consider when choosing the best free remote desktop software is, of course, security. This can your first line of defense against any unwanted attacks from outside the walls of your network. Check if your free remote desktop software offers a strong password for authentication purposes. This will ensure that every remote access made on your network is authenticated. Also, consider if the software offers you with strong video encryption. This can prevent any unwanted recordings of any confidential interaction between you and your clients. If you have multiple monitors set up in your office, then you may want your free remote desktop software to have this feature. With this, you’ll be able to navigate through a number of monitors all at the same time. This makes your work a lot more convenient and faster. Go for the free remote desktop software that has its tools packed in a neatly organized console. This will provide you with the easiest and the most natural remote desktop experience out there. You definitely don’t want to work with a free remote desktop software that is quite complicated to use and navigate. Your free remote desktop software should be accessible, and provide you with fast connectivity. That’s why you should go for the one that doesn’t need to configure your firewall settings first before making any connection. Remote desktop tools that use standard technologies and protocols usually have this feature. With this, there’s also no need for any additional software or hardware configuration. This feature will allow you to manage your connection seamlessly. With this, you can customize the appearance of your screen and the remote desktop you’re connecting to for the best visual experience. 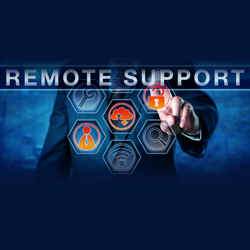 This feature will allow you to get support from your free remote desktop software provider. You can also voice out your concerns here and suggest new features for your free remote desktop software. Investing in remote desktop solutions means transforming the way you operate your organization. This enables you to maximize your business efficiency and provide workplace mobility to your employees. Moreover, it saves your company more money in the long run, allowing you to attain the goals you have for your business. Does Free Remote Desktop Software information is helpful?